With some 137 000 citizens, the City of Lévis is the main urban, economic and institutional center of the great Chaudière-Appalaches region, making up more than a third of it's population and economic activity. Lévis holds a stimulating and leading role in the region, which is constantly increasing in importance in the geopolitic context of the new City of Lévis since 2002. It's territory abounds in diversity and nature and covers an area of 444 square kilometers, of which 10% is urbanized, 46% is cultivated farmland, 36% is forestry and 6% is made up of swamp land. The City of Lévis stretches along the St-Lawrence River from St-Nicolas (west) up to the Pointe Lévis (east). Located in the northern part of the Chaudière-Appalaches administrative region, it is nested between Bellechasse (east), Beauce-Nord (south), Chutes-de-la-Chaudière (west) and the St-Lawrence River (north). Crossed by the Transcanadian Highway (Autoroute Jean-Lesage) and the Transcontinental Railway, on the shores of the St-Lawrence Seaway, the City of Lévis enjoys a unique geographical location in terms of transportation. It is linked to the National Capital by the Quebec and Pierre-Laporte Bridges, as well as ferries. This short maritime crossing between the historical hearts of both cities is used by thousands of pedestrians, cyclists and automobiles daily. 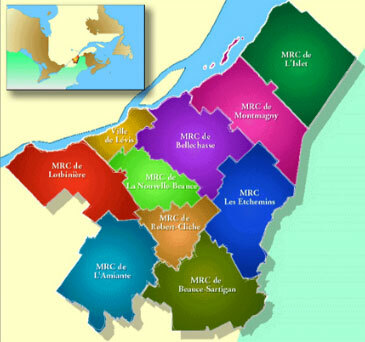 The City of Lévis offers a privileged life environment, favorable to the blooming of families who chose to live there. The urbanized areas of the territory count many parts that have been preserved in their natural state and which allow for the practce of many outdoor activities. Many sites offer exceptional sights on the fortifications of Quebec, the port and nautical scene, the bridges between shores and the Île d'Orléans. With a complete network of sport and touristic facilities, the City of Lévis is also a place where art and culture flourishes. Touristic gateway of the Chaudière-Appalaches and of the Quebec's National Capital's region, as well as the Eastern Quebec and Maritime region, Lévis counts on its historical, cultural, heritage and recreational tourism appeal. The City of Lévis attracts interest from a growing number of regional and foreing visitors as well as new economic projects that shape the community. Large corporations and institutions in Lévis feed the dynamism and economic growth of the area. Whether it be in commerce, services or manufacturing, this entrepreneurial dynamism provides solid and varied economic foundations that benefit the whole region. Namely, Lévis will have it's own technology park, the Innoparc, which will welcome it's first companies in 2009. This project is part of a process aiming to develop the city and reinforce the technology-oriented businesses on the Levis territory. The demographic structure, the participation rate of it's workforce and the low uneployment rate all contribute to the vigor of it's metropolitan community, counting more than 700 000 people. Choosing Lévis to live or to do business is betting on a remarkable quality of life, a diversified, solid and ever growing economy while enjoying services that adequatly meet the needs of it's citizens, businesses and institutions. To learn more about the City of Lévis, visit www.ville.levis.qc.ca or come and visit us!